It is important that physicians have a framework that they can use to show stakeholders the results of their examinations of a worker’s injury. The framework the physician uses is the standard used by the entire state so that they can agree or dispute the results within the language of the framework. This framework is the AMA Guidelines, a book divided into several editions that is used in most states to measure permanent impairment as a result of injuries. This is a quick primer intended to give a little information to those unfamiliar with the Guides. “In 1956, the Board of Trustees of the American Medical Association (AMA) created an ad hoc committee on Medical Rating of Physical Impairment to establish a series of practical guides for the rating of physical impairment of the various organ systems. As the scope of the Committee’s work broadened, its name was changed to the Committee on Rating of Mental and Physical Impairment. From 1958 to 1970 the Committee published 13 separate “Guides to the Evaluation of Permanent Impairment” in the Journal of the American Medical Association. What are the AMA Guides? The AMA Guides are, as stated, practical guides for rating permanent impairment after an injury has reached MMI, or Maximum medical improvement. Different states that use the Guides use terms like permanent impairment or partial permanent disability, to describe the extent of the injury. Each body part, be it bone, muscle, organ etc. are given a framework of motion or functionality that can be measured to establish how functional they are after an injury, in comparison to how functional the body part once was. In order to do this, doctors use a series of different tools and diagnostic tests to establish outcomes like range of motion, spinal asymmetry, mental health and more. These tests can range from the use of a paperclip to an MRI machine. In the first edition, the Guides were separated into a series of different pamphlets, each containing a set of body systems. After the guides were compiled, they became a single large book. Where are the Guides used? Not every state in the U.S. has implemented the Guides, though a majority of states use some edition of them, going back as far as the 3rd. Since each state has its own system that pertains to workers’ compensation, each gets to determine how physicians rate injuries in the workplace. While some state governments have chosen a specific version of the guides in their practice, other state governments have written into their constitution that the state will use the most current version of the guides. There is a trade-off for updating the law to meet the current version of the guides. The benefit is that the Guides reflect the most recent findings from the nation’s top medical professionals in order to be medically accurate. With each update of the Guides however, not only do all stakeholders in the state have to adopt and learn the new standards for the guides, but they have to keep tabs on which version of the guides were being used for injuries that happened up to decades before. This means that physicians, lawyers and insurance carriers may have to know the rule sets to all six of the current editions. When are the Guides updated? 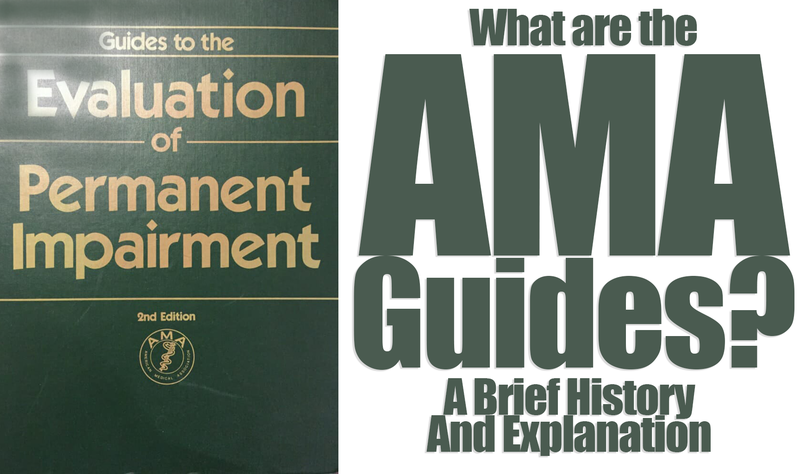 The Guides have had an update, or a revision to the current edition every few years from the 1960’s, until the most recent edition, the AMA Guides 6th Edition was released in 2008. When the guides are updated, it’s usually to revise or update definitions and concepts. Many have criticized the guides for inconsistent information, outdated terminology, biased ratings systems, and much more. Some definitions have to be entirely redefined, like ‘impairment’ and ‘disability. The AMA listens to criticisms and updates the Guides as they see fit. New versions of the Guides are released when deemed necessary, rather than on a scheduled basis. As is the way with large groups of stakeholders prone (and entitled) to giving their opinion, new versions of the guides are usually met with criticism. Why do Stakeholders Benefit from the Guides? An employer and their insurance carrier wants to be sure they’re giving out the accurate and proportional amount of compensation for a workplace injury, and no more. Whereas the injured worker wants the same thing, and no less. Between the stakeholders, the physician uses the Guides to give a precise number to the severity of the injury. This number, based off of the physician’s examination is then available for stakeholders to accept or dispute. Without the Guides, and without a concrete outcome for the permanent impairment of the injury, the doctor’s report would be up to interpretation by all parties, and work comp claims would drag on longer than they already do. Though the Guides act as a ‘language’ used by the stakeholders, many dispute their usefulness. Since updates to the Guides include updates to definitions of very broad subjects like Impairment and Disability, some stakeholders find that the Guides complicate claims when parties get tangled in these definitions. That being said, states like Illinois have adopted the AMA Guides as their state standard as recently as 2011. Meanwhile states like Indiana have no state specific rule set, so they use the guides as a reference. How are the Guides Applied to a Work Comp Claims? A physician treating an injured worker uses the AMA Guides to rate an injury when the injury has reached MMI. Once the worker’s injury stops improving, the doctor writes a final report. For example, in California this is the Permanent Stationary Report (PR-4). The physician then turns to the AMA Guides to calculate the worker’s permanent impairment. In this final impairment report, the doctor may describe how the injury has impacted the worker’s ADLs (Activities of Daily Living), report on the worker’s pain level, the imapcts of medications, the measurements of the injured body part’s range of motion. Whatever the AMA Guides says is relevant to the impairment rating should be included in the report and used to determine the rating. Not all states require the AMA Guidelines to be used in the creation of the final physician’s report, but almost all states have a ruleset that determines the measurements for specific injuries all over the body. We’ve seen that the Guides can cause trouble for stakeholders. Insurance carriers may feel that loopholes and inconsistencies in the Guides produce inflated impairment ratings, while patients may feel that the Guides don’t produce an impairment rating that reflects the impact their injuries have had on their lives. However, imagine the complications that would arise from the alternative. What if every physican invented their own system for measuring work injuries, and used their own personal set of rules for evaluating workers’ impairment? The AMA Guides may have its flaws, but without some sort of a standard, it’s easy to picture the complications that would arise. People use the figure of speech ‘being on the same page,’ to mean understanding one another. In this case, it’s important to ‘be on the same page’ of the AMA Guidelines. Would you like to quickly make workers' compensation a more profitable and streamlined part of your medical practice? We've got you covered. Click here to check out RateFast Express. Have a question? Want to see a specific topic covered? We'd love to hear from you. Join the RateFast Email List! Can’t I Just Get a QME Just Write My Impairment Report? Copyright © 2019 RateFast Blog All rights reserved.